– Jan 26, 2009: Acer Aspire One D150 – This February? 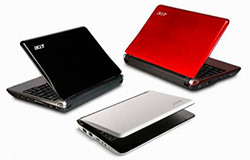 – Jan 22, 2009: Acer to Phase Out 8.9â€³ Acer Aspire Ones? – Acer Aspire One AOD150-1BW (LU.S550B.069) – N280 1.66GHz, 1GB RAM, 160GB HDD, Windows XP, White ) – See link at top of page for pre-order information. Warranty: Varied by country – standard 1 year carry-in in some areas.